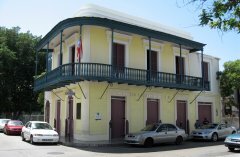 The Ponce Massacre Museum is located at the intersection where the tragic event took place back in 1937. Right in front of the then headquarters of the Puerto Rican Nationalist movement, on a holy Palm Sunday, March the 21st. It sadly commemorates the victims to one of the most violent chapters in the history of Puerto Rico. Just a mere example of the repressive tactics and plain civil right violations to which the local population has been historically subjected (before and) after the 1898 American invasion. An independent investigation by the US Commission for Civil Rights, led by the American Civil Liberties Union’s own Arthur Hays, concluded the events in fact constituted a massacre ultimately ordered by the US appointed military governor at the time, General Blanton Winship. Up to 200 heavily armed men interrupted, with indiscriminate deadly fire, a peaceful pro-independence demonstration that provocatively had its permit withdrawn at the very last minute. The 15 minute entrapment ended with the death of 17 unarmed innocent civilians (including a woman and a 7 year old girl) plus well more than a hundred wounded, many of which were chased and shot or clubbed at the entrance of their own homes. No arms were found in the hands of the civilians wounded, nor on the dead ones. The museum houses photographs and various artifacts from the Ponce Massacre episode. A section is also dedicated to the Father of the Puerto Rican Nation, Harvard graduate and Ponce born, Dr. Pedro Albizu Campos. 787.844.9722 – WED thru SUN (8:30am-4:30pm) – FREE ADMISSION. Check the following informative Democracy Now! clip upon the 70th anniversary of this tragic incident.